Canadians have one more option to make long-distance calls from a cell phone without paying a hefty bill with the release of a new app, Dell Canada announced today. The Voice over Internet Protocol (VoIP) app was created by Cambridge, Ont.-based Fongo and is available on iPhone, Android and will be coming soon to BlackBerry. Users that install the app and register for the service receive a new phone number and can then place free long-distance calls across most of Canada. They can also get voice mail, caller ID, call waiting, and other services typically delivered by a wireless carrier. VoIP technology places calls over a carrier’s data networks. Dell is pitching the service to Canadian small and medium-sized businesses as a way to cut phone bill costs. It will “help Canadian consumers and businesses to stay connected without breaking the bank,” says David Gair, marketing director for SMB at Dell Canada in a press release. 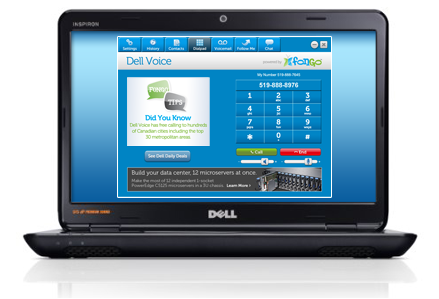 Dell Voice is available for smartphones and Windows PCs. The service is similar to Skype, a VoIP application that many Canadians use on smartphones, tablets, and computers. But unlike users in other countries, Canadians are not able to get a phone number registered on Skype without using a third-party service. So while Skype can be used to make outgoing calls, it can’t be used to receive them without help from an outside service provider. Fongo will still have its own app launched within the next several months, Stix says. It could have a different feature set and a different look and feel geared towards youth. Offering free calling is a surprisingly good business model that results in reliable lead generation, Stix says. About 20 per cent of customers who sign up for his companies’ free VOIP phone service will ask for more, paid-for telecom services. “It’s a fabulous company that allows us to gain significant market share in Canada. We hope those users will get familiar with the Fibernetics brand and look to them for the rest of their telecom needs,” he says. Fibernetics’s telecom network reaches 85 per cent of the Canadian population and has a stated mission of eliminating the cost of the common phone line in Canada for consumers and businesses. The network has been used in the past to launch free calling apps sponsored by Budweiser Canada and freephoneline.ca. Canadian cities that Dell Voice users can call for free are listed here. Rates for other Canadian locations and international numbers are typically pennies per minute.